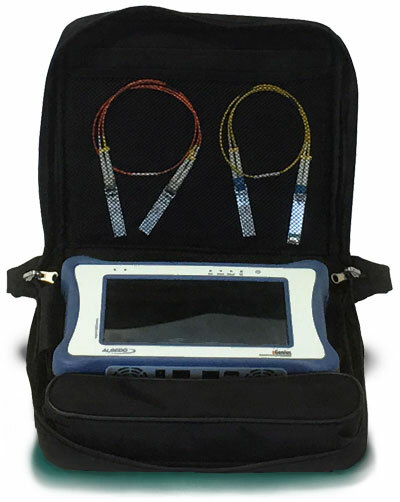 xGenius is a handheld transmission and synchronization tester equipped with multiple network interfaces and a large capacitive screen. It is light (1.9kg) and very rugged. The unit is able to test Ethernet/IP networks up to 10Gb/s while supporting master/slave Sync-E/PTP emulation. It also has interfaces for T1/E1, Datacom and C37.94. Operation modes Performance, Quality and Wander tests at all interfaces and the ability of PTP/SyncE emulation and analysis, while measuring Freq./Phase, PDV metrics, analyse/generate TIE/MTIE/TDEV and TE. A built-in Rubidium clock provides high accuracy in hold-over. The instrument is ideal for LTE/TDD/5G deployment because it has EVERYTHING engineers need in IP/Ethernet backhaul and PTP/SyncE synchronization. Field experts do not need to carry several testers with multiple modules to turn up and monitor communication infrastructures. xGenius is equipped with all of the features you may need or imagine such as Master/Slave PTP emulation up to 10Gb/s, BER, RFC2544, eSAM, Multistream, MPLS, Jitter, Wander, etc. to permit the verification of the transmission layer in those terms of performance and quality required to support critical applications. Built with latest technology it is a light while rugged tester that facilitates many hours of continuous operation. ALBEDO xGenius is a field and lab tool built in a rugged case.The unit is supplied with all the interfaces then any option can be activated with a simple code. For technicians responsible of the installation, commissioning and maintenance of communication infrastructures this test set provides valuable insight and simplifies complex issues by illustrating the full network picture.